Can Big Box Retailers Serve the Intercultural City? Yesterday’s Denver Post and the previous day’s New York Times contained stories relevant to the ongoing debate about how to develop 9th and Colorado. The Post offered a concise summary of where things stand on the eve of next week’s Denver Planning Board Meeting (to receive comment on the 9th and Colorado Design Guidelines) and the Colorado Boulevard Healthcare District Board meeting (to receive public comment more generally). Local Neighbors: Concerned about Walmart’s corporate practices, the “Walmart Effect” that puts smaller retailers out of business, exacerbated traffic congestion, and whether the store’s proposed “two-story structure with underground parking will truly blend in with the overall project’s architecture.” [The last issue strikes me as a non-starter, since nothing seems to have been specifically decided about site architecture]. 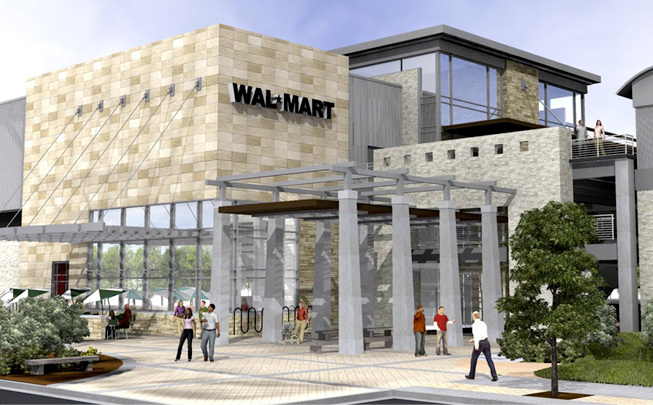 Fuqua Development: Not likely to go forward with the project without a Walmart, because Walmart is the only Big Box retailer willing to fit into the constrained space and conform to other requirements of the site plan. University of Colorado: Approaching “deal fatigue” because its been paying $500-700,000 per year for the last 9 years to maintain the site and it simply can’t keep bleeding this money. Denver Office of Economic Development: Anxious to generate revenue and “avoid sustained blight” at the site, while appreciating the need to balance economic development with the community’s concerns. In Chicago, for instance, [Walmart] has agreed to build stores with union labor, and it has donated to politicians and community groups in cities where it hopes to build…“It’s become easier to site a Walmart, and we have become more accepted by the community,” Leslie Dach, executive vice president for corporate affairs at Wal-Mart, said last month. Wal-Mart’s city-store prototype near Toronto, a 90,000-square-foot store that opened this year…found that many nearby residents were recent immigrants living in apartments, and one of the first improvements they wanted to make was to their bathrooms, said Alan Blundell, vice president for Wal-Mart merchandise operations in Canada. So the store stocks a higher-than-usual quantity of toilet seats and shower heads. Perhaps this isn’t much, but it also could be a good start. Especially if the company will start treating its in-store employees and foreign suppliers with the same respect it promises to treat construction workers and, at least in Toronto’s case, local residents. Low prices at Walmart come at a huge cost. The number one employer in the United States has already ruined American manufacturing, forced most retail workers into poverty, and will bankrupt cities just like they’ve bankrupted middle America. Shop at Walmart and all the profits that could have benefited the businesses owned by your friends and neighbors will now enrich Walmart CEOs and shareholders instead. July 26, 2012 at 8:37 a.m.
Sure, big box stores are full of inexpensive stuff, almost all of it made overseas. But American manufacturing is never going back to where it was in the 60’s and not all inner-city residents live in million dollar condos filled with residents who mostly dine out and haven’t a clue about the price of toilet paper, detergent, etc. Give the middle to lower income city dwellers a chance to purchase household items at affordable prices. They can’t shop at Nordstrom for school clothes anymore than they can buy kitchen items at William-Sonoma. And, while you are snubbing the big box stores for inventory of cheap goods made overseas, start reading the labels at the higher-end stores. They have huge inventories of clothing, shoes and household items all made overseas (and I don’t mean leather goods from Italy)– only with a much higher price tag. What lower income family can pay $75.00 for a single designer label Egyptian cotton bath towel? July 26, 2012 at 10:12 a.m.